Wondering what communication scholars are thinking of during the Christmas season? Here is a selection of articles found through searches of Communication & Mass Media Complete, Communication Abstracts, and Film & Television Index. Campbell, W.J. (2005). The grudging emergence of American journalism’s classic editorial: new details about “Is There a Santa Claus?”. American Journalism, 22(2), 41-61. Clarke, P. (2007). A measure for Christmas Spirit. Journal of Consumer Marketing, 24(1), 8-17. Kimura, J. & Belk, R. W. (2005). Christmas in Japan: globalization verus localization. Consumption, Markets & Culture, 8(3), 325-338. Krider, R.E. & Weinberg, C.B. (1998). Competitive dynamics and the introduction of new products: the motion picutre timing game. Journal of Marketing Research, 35(1), 1-15. Nathanson, P. (1993). You can’t go home again…or can you? Reflections on the symbolism of TV families at Christmastime. Journal of Popular Culture, 27(2), 149-161. O’Cass, A. & Clarke, P. (2002). Dear Santa, do you have my brand? A study of the brand requests, awareness and request styles at Christmas time. Journal of Consumer Behaviour, 2(1), 37-53. Pawlowski, D.R., Thilborger, C. & Cieloha-Meekins, J. (2001). Prisons, old cars, and Christmas trees: a metaphoric analysis of familial communication. Communication Studies, 52(3), 180-197. Ray, G., Maguire, K. & Poulsen, S. (2007). Constructing and performing family identity: an analysis of American holiday letters. Conference Papers — International Communication Association, 1. Turner, L.J. (2005). Elmo’s story: a ticklish media creation. Public Relations Review, 31(2), 297-299. Tuten, T.L. & Kiecker, P. (2009). The perfect gift card: an exploration of teenagers’ gift card associations. Psychology & Marketing, 26(1), 67-90. 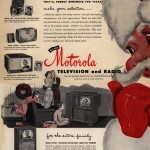 Image retrieved from AdViews, a digital archive of thousands of vintage television commercials and advertisements dating from the 1950s to the 1980s from Duke University Libraries Digital Collections.